The Exit Light Company offers a complete selection of fire extinguishers designed to meet the specific requirements of many different locations and types of potential fires. Properly installed and maintained, fire extinguishers help you stop small fires before they become a problem. When choosing a fire extinguisher, bigger is better. Larger fire extinguishers last longer, giving you more time to fight the fire and get to safety. 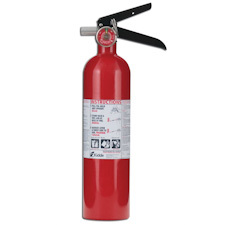 The KD-PRO-25MP-ASB fire extinguisher is sold in cases of 6. Suitable for use on Class A (trash, wood & paper) Class B (liquids & gases) and Class C fires (energized electrical equipment), this unit is fitted with a pressure gauge that provides at-a-glance status. It is manufactured from lightweight aluminum cylinder & sturdy aluminum valve assembly and comes with metal retention bracket. A clear instruction label using graphics and easy-to-pull safety pin ensures that anyone can use this product under pressure.